Components of a Bosch coil are seen below. The 6-12 volts provided by the battery is converted to high voltage ignition current by the coil. The secondary winding consisting of many turns of thin wire is wound around a laminated iron core. The primary winding consisting of a few turns of heavy wire is wound around the secondary windings. 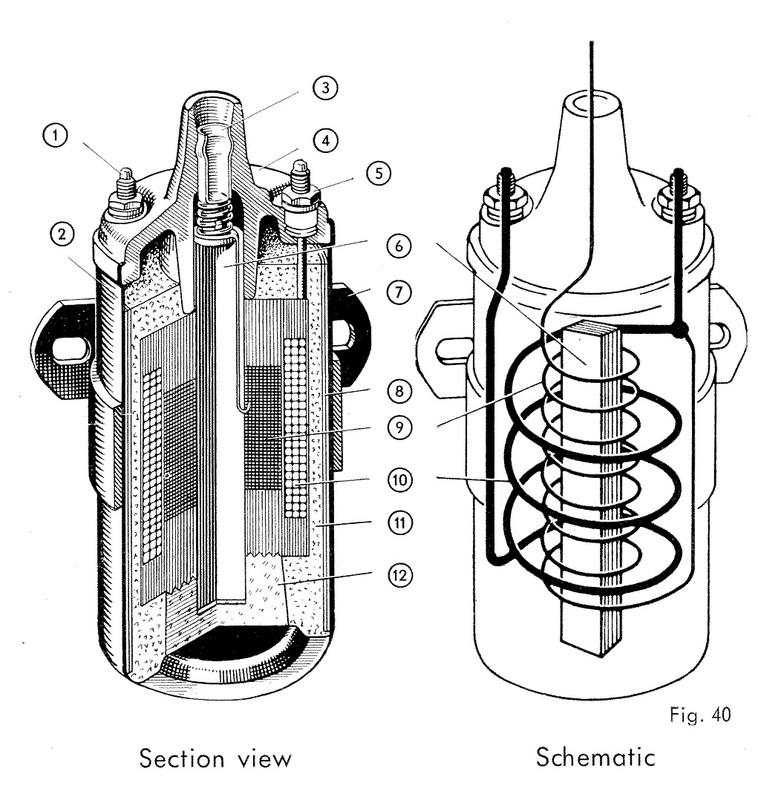 The iron core is supported by a ceramic insulator at the bottom and by the coil cap at the top. The coil is enclosed in a soft iron shell which acts as a magnetic conductor. The Bakelite cap with the HT socket and terminals is secured to the metal housing. The coil is filled with an insulating compound to ensure good heat dissipation from the windings to the metal casing. 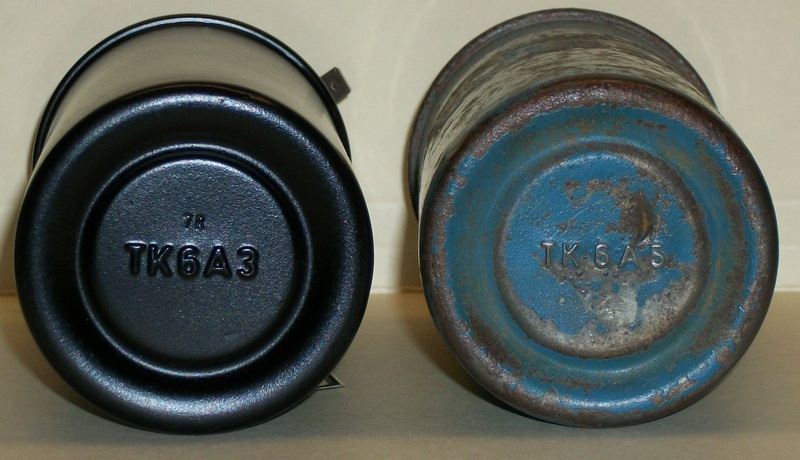 The 6V coils used in the 356 were stamped with model number TK6A3 or TK6A5, though other variations have been used. The standard coil starting sometime around 1953 was the black TK6A3. 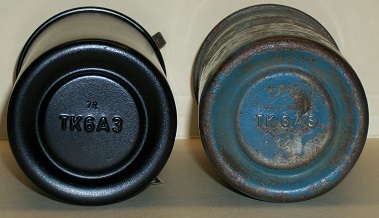 The blue TK6A5 was used in applications, as described by Bosch, "for especially high number of sparks". This application for Porsche was with the 356 Carrera 4-cam. Date codes are stamped on the base of all original coils, using the Bosch's numbering/lettering system. For example, the coils below are marked 7R (7/60) and 1M (1/56). A date code table can be found at the bottom of this page. 1. Primary resistance between terminals 15 (+) and 1 (-) should be in the range of 1.2 to 1.5 ohms. This is low because of the relatively few turns of heavy wire in the primary winding. An open or shorted circuit indicates failure. 2. Secondary resistance between the HT terminal (+) and terminal 1 (-)should be 5.5 to 8.0 K-ohms. This is high because of the secondary wire diameter and length, which carries a lower current. An open or shorted circuit indicates failure. 3. 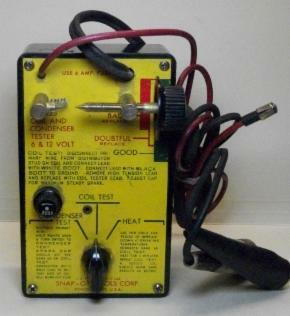 An adequate spark should be created under test, at least 5mm in a Coil Tester (see Testing page). 4. No degradation in spark with extended breakdown testing at an elevated temperature using a Coil Tester. 5. No cracks in insulator cap that can result in arcing between terminals. 6. No damage to the metal housing. Coils are tested for primary and secondary winding resistance as well as the length of the spark produced. Primary resistance between terminals 15 (+) and 1 (-) should be in the range of 1.2 to 1.5 ohms. Secondary resistance between the HT terminal 4 (+) and terminal 1 (-) should be 5.5 to 8.0 K-ohms. A coil tester, like this Snap-On unit, allows for testing of a coil's spark on initial operation and under breakdown testing (with heating). Porsche specified a 14mm spark with a 1.8 ohm test resistor at 2.8A primary current on a Bosch EFMZ1 tester. This corresponds to approximately 5mm or longer on a Snap-On tester. We can test and restore original coils that meet the above conditions and show no other signs of failure. The process involves cleaning and polishing of the insulating cap, cleaning and stripping the metal housing, and filling any small dents or blemishes. Hardware is restored or replaced. The date code is noted and preserved during the refinishing process. The housing is acid-etch primed and painted with a finish to match original. Original style stickers are applied. The bracket (when furnished) is stripped and zinc-plated, as original. We also can supply plated original or replacement brackets. 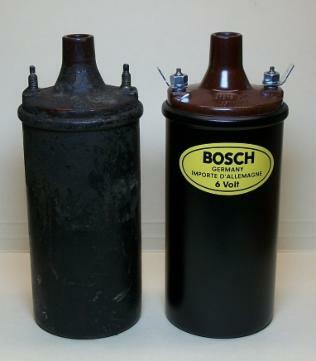 Bosch used a few conventions of date coding including use a month/year system that used a letter to designate the year.